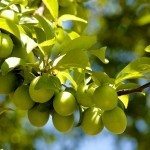 Plum trees are a lovely addition to any landscape, but without proper trimming and training, they can become a burden rather than an asset. 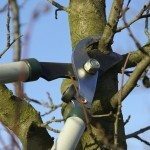 Although plum tree pruning is not difficult, it’s important. Anyone can trim plums, but timing is important, as is consistency. Therefore, learning how and when to prune a plum tree is imperative. The purpose of pruning and training is to encourage tree health and increase fruit yield. When plum trees are not carefully pruned, they can easily become heavy and break under their fruit load. Developing a strong foundation is essential to the life of any fruit tree. In addition, keeping fruit trees well pruned protects against both disease and pest infestations. The time for plum tree pruning depends on the maturity and type of plum tree. Young plums are generally pruned in early spring, before bud break, in order to avoid infection by silver leaf disease. Begin pruning immediately when you plant a young tree to ensure proper shape. Established fruit tree plums are best pruned in mid-summer. Trimming flowering plum trees is not advised. All young fruit trees need some pruning to get them off to a good start. Plum trees are best pruned in a vase format to get a short trunk with three or four major branches to come off of the trunk at a 45-degree angle. This allows plenty of light and air into the tree. Always use sterilized and sharp pruning shears when you trim. The central leader branch should be cut back to 2 feet above soil level on new trees. Always make the cut just above a bud. Once you have made the cut, you can rub off the bud directly below the cut. Be sure that there are at least three buds below. When you prune in the second year, cut the main stem back to 18 inches above a bud. Below this cut, there should be at least three branches. Prune these branches to 10 inches, on an angle, immediately above a healthy bud. Prune three-year-old trees in a similar fashion by trimming the main stem to 18 inches above a bud. Trim the three or four branches immediately below to 10 inches. Once your tree is established, it’s important to prune only branches that have not produced fruit in that year. Remove all dead wood and dispose of it. Trim all side shoots to six leaves from their parent branch to encourage fruiting next year. Keep the central stem no more than 3 feet from the highest branch. When and how to trim plums shouldn’t be discouraging. Simply learning the basics of how to prune a plum tree will provide you with the necessary tools for growing a healthy, happy tree and plenty of fruit.